Company Details – About ME. This large beautifully hand coloured original antique map of central Europe – centering on the various German States but stretching from Poland in the east to France in the west and Venice to the south – by Justus Danckerts was published in 1699. In the latter half of the fifteenth century Germany, though nominally still part of the Holy Roman Empire, was a fragmented land, split into a score of principalities and Imperial Cities, fiercely jealous of each other but having in common an extraordinary creative urge which produced builders of great churches and cathedrals, workers in stone and wood, metal engravers, painters and makers of scientific instruments, who were the envy of the world. Of all their achievements, the invention of movable-type printing was to have the most profound effect on human relationships. Printing industries soon grew up in many cities, including Nuremberg and Augsburg where wood engraving already flourished and which, with Basle and Strassburg, were also the centres of geographical knowledge. 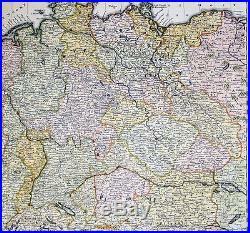 Not only were local and regional maps produced in considerable variety and quantity, but more particularly the geographers and mathematicians of Nuremberg are famous for their globes of the world, some of which are still preserved. The most important map of the whole of Germany produced in this period was a manuscript dated c. 1464 by Nicholas Cusanus (Khryfts), Cardinal, humanist and scholar, friend of Toscanelli, the Italian geographer, and one of the most brilliant men of his day. 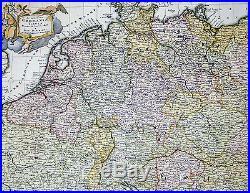 The map covering Germany, Southern Scandinavia and the Baltic was printed in 1491, long after the author’s death, and it served as a model for a similar map in the Nuremberg Chronicle. We have written in some detail in Chapter 4 of this famous book, first published in 1493, which contained a great number of woodcut views and maps, but as far as cartography is concerned the printing of Ptolemy’s Geographia at Ulm in 1482 (and 1486) – the first edition with woodcut maps – was an event of the greatest importance. The most ambitious editions of the Ptolemy maps appeared in 1513 in Strassburg, containing not only maps of the ancient world but also twenty new ones, including one of the’New World’, based on the latest contemporary. This was produced under the guidance of Martin Waldseemuller, a German cartographer, at St Die’ in Lorraine, at that time a noted centre of learning. Other editions followed in the years up to 1 541, overlapping with the newer work of Sebastian Mu’nster, an eminent mathematician and linguist, who settled in Basle and whose prolific output of atlases and maps contained also many plans and views of the great cities of the time. These in turn were superseded by Braun and Hogenberg’s Civitates Orbis Terrarum issued in Cologne between the years 1572 and 1618, which was one of the most famous publications of the period. In the seventeenth century Dutch supremacy in map making and publishing overshadowed Germany no less than England and France and there was to be no revival until the foundation in Nuremberg about the year 1700 of the printing firm of J. Homann, whose business acumen started a resurgence of map publishing. He became a member of the Berlin Academy of Sciences and was appointed Geographer to the Emperor in 1715. The business was continued by his son, Johann Christoph, and was eventually bequeathed to the founder’s son-in-law on condition that he continued the business under the name of Homann Heirs. Other notable publishing houses active during the century were run by Matthaus Seutter and Tobias Lotter in the rival city of Augsburg. Please note all items auctioned are genuine, we do not sell reproductions. A Certificate of Authenticity (COA) can be issued on request. General Description: Paper thickness and quality: – Heavy and stable Paper color: – off white Age of map color: – Early Colors used: – Yellow, green, red, brown. General color appearance: – Authentic and fresh Paper size: – 24in x 20 1/2in (610mm x 520mm) Plate size: – 23in x 19 1/2in (585mm x 495mm) Margins: – Min 1/2in (10mm). Imperfections: Margins: – None Plate area: – None Verso: – Bottom centerfold re-joined, no loss. Overall Quality (in Bold): Perfect/ Fine /Very Good/Good/Fair/Poor. Australian buyers please add 10% GST. These are the options available. Courier with online tracking. Classical Images was founded 1998 and has built an excellent reputation for supplying high quality original antiquarian works on paper at affordable prices. We carry an extensive inventory of antiquarian collectibles from the 15th to 19th century, a period that produced achievements by some of historys finest explorers, scientists and artists. Classical Images adheres to the Codes of Ethics outlined by the Antiquarian Booksellers Association of America (ABAA). We are enthusiastic collectors ourselves of Antiquarian treasures and are happy to share our knowledge, discuss issues and provide information and assistance, both in general and about items we offer for sale. Thank you Simon & Andrea Mayers. Since purchasing online does not give the opportunity to examine our merchandise directly we strive to give you as much information as possible in the description, condition report and images supplied for each item. We value our customers highly and will make every effort to satisfy all issues that arise. Track Page Views With. Auctiva’s FREE Counter. Get your own map of past buyers. 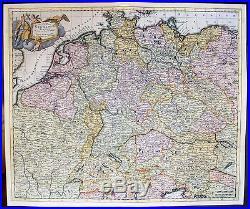 The item “1699 Danckerts Antique Map of Germany & Central Europe Poland to France to Italy” is in sale since Monday, October 29, 2018. This item is in the category “Antiques\Maps, Atlases & Globes\Europe Maps”. The seller is “searching01″ and is located in Ivanhoe, VIC. This item can be shipped worldwide.